The fourth session I attended was On Translating Linguistic Variants, presented by Solange Pinheiro Carvalho. 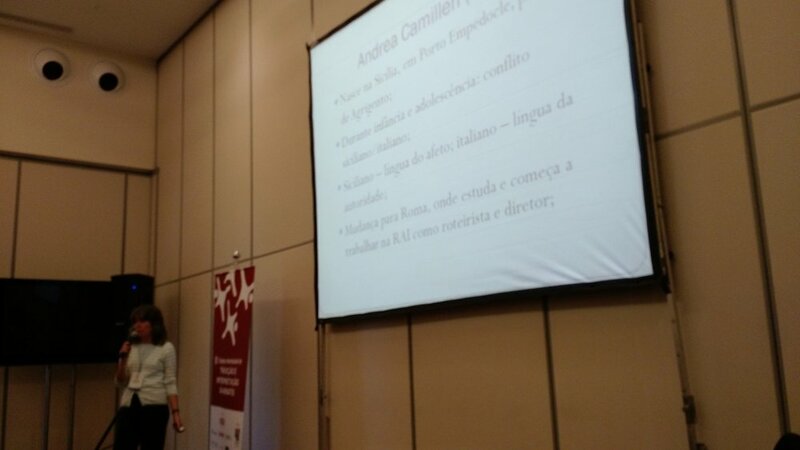 She talked about her academic research on the work of Andrea Camilleri, an Italian author born in 1925, when few Italians were bilingual and most only spoke their regional language. Solange explained that, for Camilleri, Sicilian was the "language of affection," while Italian was the "language of authority." Back then, it was not possible to talk to elderly people in Italian, since they only understood their own dialect. As for young people, they started to learn Italian at school, then oftentimes moved out of their hometown and, upon returning, could no longer understand the local dialect. This Italian reality is shown in Camilleri's writings, mainly as a way to indicate a character's language register, as well as the (social and hierarchical) interactions between characters. The presenter studied different approaches from academics, such as Pym, Lane-Mercier, Morvan, and Eco to base her research, but warned that "It's impossible to think about a general translation theory; we must analyze each particular case separately." In order to illustrate this linguistic reality, the researcher compared the evolution of national language in Italy and Brazil: While multilingualism was the rule in Italian territory―where minority or regional languages contrasted from standard Italian―in Brazilian territory there has always been a multiplicity of dialects that are mutually understandable. However, she emphasized that translators should avoid attempting a localization that could create an incorrect parallel between a dialect in the original and an accent that is characteristic from a Brazilian state, for example. In other words, it would be wrong to change a Sicilian character into someone from a northern Brazilian state. Literary Sociolect: a Study About Wuthering Heights"
Solange said this Italian multilingualism causes conflicts in both Camilleri's writings and translations, because what is considered "the educated standard" clashes with the translation of linguistic variants. "In the general consensus, we're able to match different linguistic norms," she stated in regards to the translation of a standard language into another. "But how about the linguistic variants that exist within the same language?" As an example, Solange mentioned some fragments of one of Camilleri's books, in which a character is talking to his girlfriend and ends up mixing some Sicilian with Italian, which deeply irritates her―since she only understands the latter. The presenter then reflected about how to manage this conflict in a translation into Portuguese: Instead of translating everything into the target language, which would certainly change the interaction between characters, she said some adaptations are required. "Sometimes you must find another language to create this foreignness, especially if one of the characters will resolve this conflict throughout the dialog," she suggested, mentioning that she found inspiration in minority languages from the Iberian Peninsula, such as Galician, Aragonese, Mirandese, and Asturian, which are somehow connected to Portuguese―at least enough to be understood by the reader, while creating the same effect present in the original because of some terms that are indeed out of place and incomprehensible. In some other instances, she opted for misspelling something to cause this oddness. During her explanation, she highlighted a piece of dialog from Camilleri's book in which the word signora (or "Mrs." in Italian) had been written as signura and, in order to be true to the author's intention and making the reader feel a bit off, she'd misspell the Portuguese senhora as sinhora, which is actually used in Galician. "By introducing Galician into the text, we're able to show that the character doesn't quite speak the standard language used in the original, thus keeping the same level of oddness in the translation," she assured. "I just don't know how far this solution would be considered acceptable at a traditional publishing house, because we all know there's some resistance to regional variants," she reminded the audience, adding that Camilleri's work in Italy isn't as widely accepted as it should because Italian readers think his writings are "too difficult." "If I were to translate it this way and a published put the book out like that, I'm sure they would receive many complaints about the book being badly written," she lamented.